The world’s number one accommodation booking website, Booking.com, yesterday (May 8 2014) named Lake Tekapo Lodge the best property in Oceania and Asia in its annual ‘Best of Booking’s Best’ awards. Based on guest reviews, Booking.com analysed the site’s most popular properties which were then analysed for high scores across key categories such as staff, comfort, service, cleanliness, location and value for money. Located on the shores of stunning Lake Tekapo in the Mackenzie District of the South Island of New Zealand, Lake Tekapo Lodge is owned-and-operated by Stephanie Hagen and Alistair Craig and offers unrivalled high-end bed and breakfast style accommodation. Well-travelled with extensive experience in many aspects of business and hospitality, including stints as hoteliers, chefs and winemakers, the couple took over the lodge 18 months ago and are multi-generational New Zealanders offering an authentic, professional and friendly Kiwi experience. After extensive renovations, work on the systems of the property, attention to detail and innovative marketing, Lake Tekapo Lodge is also number one on Trip Advisor for Tekapo bed and breakfasts. Speaking of the “unbelievable win”, Stephanie Hagen said she and Alistair were “still digesting the great news”. “I had to read the email three times before I fully took it in and even then I had to call Booking.com to check I wasn’t going mad,” said Ms Hagen. 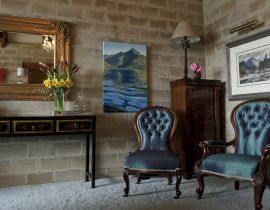 Lake Tekapo Lodge has three recently-renovated king size bedrooms with lake and mountain views, a stylish dining room for breakfast and evening socialising, quiet lounge room with library and contemporary, unique works of New Zealand art featured throughout. In the last few years Tekapo has seen a marked increase in both domestic and international visitor numbers and boasts many ‘must-do’ activities and attractions that have helped develop the region’s economy. Tekapo Springs, Earth and Sky, Air Safaris and other successful local businesses have grown and developed to draw people to the town, which is located almost halfway between Christchurch and Queenstown. Booking.com CMO Paul Hennessy said the awards celebrated “the accommodations that our reviewers love” and offers consumers an at-a-glance option for finding the right accommodation – whatever their unique need, budget or desired destination. “It enables would-be travellers to bypass hours of combing through reviews to find and book the world’s most delightful accommodations that have received the stamp of approval from fellow travellers,” he said. “We’re proud to work with our ‘Best of Booking’s Best’ accommodations to give travellers the most amazing experiences all over the world. Being called ‘Booking’s Best’ is an indication of quality that can be trusted, because it comes directly from guests,” said Mr Hennessy. To ensure the ‘Best of Booking’s Best’ recognition was given to accommodation with a proven track record of “consistently delighting customers”, Booking.com only featured accommodations that received over 50 customer reviews from the past 14 months. Lake Tekapo Lodge was one of only two New Zealand properties named in the top ten and complements the lodge’s already impressive online reviews and accolades. Aoraki Development Business and Tourism CEO Wendy Smith said she wholeheartedly congratulated Alistair and Stephanie on their “exceptional accolade”. “Booking.com is one of the largest accommodation booking engines in the world and to be ranked number one in all of Asia and Oceania is wonderful acknowledgement of the experience Stephanie and Alistair have created and also what South Canterbury has to offer visitors from New Zealand and around the globe,” she said. GREAT HOSTS: Stephanie Hagen and Alistair Craig are the ‘exceptional’ hosts of Lake Tekapo Lodge. An experience rather than a bed for the night makes Lake Tekapo Lodge award-winning accommodation. That is one of the reasons why the lodge was voted best property in Oceania and Asia by Booking.com, according to co-owner and operator Stephanie Hagen. Aoraki Development Business and Tourism chief executive Wendy Smith said she wholeheartedly congratulated Alistair Craig and Stephanie Hagen on their “exceptional accolade”. “Booking.com is one of the largest accommodation booking engines in the world and to be ranked number one in all of Asia and Oceania is wonderful acknowledgement of the experience Stephanie and Alistair have created and also what South Canterbury has to offer visitors from New Zealand and around the globe,” Smith said. The lodge is high-end, boutique-style accommodation and offers the best of Kiwi hospitality. “Both [co-owner and partner Alistair Craig] of us come from hospitality backgrounds and after travelling extensively … we decided to get our own accommodation,” Hagen said. After buying the building at the end of August 2012, and gutting the interior, the lodge was transformed to what it is today. “We built the lodge by asking ourselves what we would expect from places similar to this – Kiwi hospitality, the warmth and New Zealand history and put it together with what we like – the wines, fine local food, books and travel,” Hagen said. The lodge has four rooms – three with lake views and super king beds and one without. “We are only small. We have no intention of expanding and our reward is that we have gorgeous guests who have similar expectations and experiences to us,” Hagen said. “It is like getting friends to stay. It also marks Tekapo as a real destination and we are really proud of the contribution we made,” she said. The award was based on guest reviews. Booking.com analysed the site’s most popular properties which were then analysed for high scores across key categories such as staff, comfort, service, cleanliness, location and value for money. The lodge is also number one on Trip Advisor for Tekapo bed and breakfasts.